port has since been rendered unaccessible. Fortunately, under the current wheat shortages caused by the forex crunch, Musarara asserted that his organization has been able to supply up to 50% wheat demand by local bakers. This is contrary to claims the millers representative group entrusted with public funds was doing little to ease recurrent shortages of the staple food in the country. According to Musarara, wheat supplies are set to improve in the next coming few weeks once a new plan has been effected. GMAZ was paid approximately US $25m by RBZ in 2018 to source wheat for the country. At the moment, he said, more than 100 trucks were still stuck in Beira because of the disaster. he Kenya government, through the Nakuru County government, has set aside US $103,404 for setting up a fish processing plant. The plant will be located on the shores of Lake Naivasha. The plant, according to the Nakuru County Fisheries Officer Mathew Ngila, is projected to reach completion within in the next two months. The county officer further disclosed that the facility would also include a fish market. As such, those currently selling fish in the open-air market are to be relocated to the new establishment. Mr. Ngila explained that the plant is expected to process about two to three tonnes of fish daily. This, he adds, will act as a major boost of income for the fish stakeholders Mr Ngila said that the processing plant would include a bulking unit with cold storage facilities for value addition of fish products and to improve on hygiene in handling fish. He further added that those selling fish at the various termini have already been alerted of the relocation plan by the county government. Meanwhile, there is an initiative to establish model roadside fish market along NaivashaNairobi highway to control fish hawking and at the same time create more jobs for the youth. Furthermore, a second tender for building small units to host fish traders has already been awarded. Mr. Ngila added that they expect to hire out the new units to those who will do value addition. To make fishing sustainable, he said the county has restocked over 100,000 fingerlings. He also added that the current restocking phase targets another 100,000 this financial year Fishing in Lake Naivasha directly supports at least 700 fishermen. At the same time, more than 5,000 people are indirectly involved in the fish value chain. lower Songwe Dam and Hydro Project, construction of several village-based schemes, two major irrigation schemes and construction of the Songwe and Kasumulu towns’ water supply schemes. Speaking at the function, Tanzanian Minister of Water, Jumaah Aweso expressed his enthusiasm for the project and highlighted that this signifies a continuing rise in positive relationships between Malawi and Tanzania. The Project’s first phase will run for 10 years. It is expected to attract support from several donors including the African Development Bank. Earlier on, Mwanamveka thanked the 2 countries’ presidents for cultivating excellent bilateral relationships between the two countries. is in addition to there being careful consideration in implementation. Poland and Tanzania have enjoyed long and healthy bilateral relations that cut across agriculture to trade, investment, water supply and education. Last year, Poland’s foreign investment in Tanzania had reached US $110m. This is according to the Deputy Director at the Department of Economic Cooperation in the Polish Ministry of Foreign Affairs, Konrad Pawlik. According to NIC National Irrigation Master Plan (NIMP, 2002), Tanzania has at least 29.4m ha suitable for irrigation. Out of the potential area only 475, 052 ha under irrigation has been developed. outh Africa is projected to experience shortage in maize output following the drought. Furthermore, supplies of the staple maize are anticipated to decline to their lowest level this month. Fortunately, the countryâ&#x20AC;&#x2122;s stocks are set to satisfy needs in graindeficit countries for the remainder of the 2018/19 farming season. The positive developments come despite South Africa expecting below-average maize harvests alongside Zambia and Zimbabwe. According to FEW NET, maize supplies in the region were falling seasonally on major markets in the region as the lean season peaked. FEW NET reported export similarity prices for white maize grain increased marginally in January and were 55% above their year-earlier levels. On the other hand, South Africaâ&#x20AC;&#x2122;s exports to the international market will likely decline in the coming months due to less competitive prices. This is according to the Famine Early Warning System Network (FEWS NET) after year another unfavorable farming season mostly due to erratic rains. and Tanzania while increasing rapidly in Malawi and Zimbabwe as supplies dwindled. In Zimbabwe, maize grain prices increased by up to 87% and were respectively 197 and 155% above their 2018- and five-year average levels. This has been partly attributed to ongoing fiscal and monetary challenges. In Malawi, maize grain prices increased by up to 31% as market supplied declined sharply. In Mozambique, maize prices were increased by up to 44% and were above levels recorded a year earlier. Tanzania has ample supplies compared to previous seasons. report, Africa will have an additional 1.3 billion people by 2050. Most of the growth will happen in the cities, posing a challenge for African governments to ensure smart and sustainable urban planning. This is the context within which Kenya’s decision to co-host the One Planet Summit and actively fight climate change becomes significant. In the run-up to the Summit, Monica Juma, cabinet secretary in Kenya’s ministry of foreign affairs, said, “We’ve begun to frame Nairobi as the world global environmental capital.” She indicated that Kenya was determined to upscale discussions on the sustainable use of natural resources in line with United Nations’ Sustainable Development Goals. A lot of jargon has been thrown around – better land management, biodiversity protection, the promotion of renewable energy and the need to foster resilience and adaptation among populations vulnerable to the effects of climate change. These are not merely symbolic for Africa. They are substantial. The continent is uniquely placed in the climate change debate. It has both immense challenges and extraordinary opportunities. Preservation of biodiversity is a key issue for the African continent. Experts say climate change, alongside land degradation and habitat loss, could cause some African animal species to decline by as much as 50 per cent by the end of the century. The threat to Africa’s forests is dire. Nearly 20 per cent of the African continent is covered by forests, including the world’s secondlargest tropical rainforest, the Congo Basin Forest, known as the “green lung of Africa.” As President Kenyatta will say in his call to action at the One Planet Summit, “forests constitute a resource of great economic, cultural, spiritual and scientific value whose disappearance would be irrecoverable”. In November, Patricia Espinsoa, Executive Secretary of UN Climate Change, said: “Few other places on earth suffer the devastating impacts of climate change and biodiversity loss like the continent of Africa.” Some African entrepreneurs are already investing in innovation and green energy. Malian Samba Bathily, CEO of Africa Development Solutions, recently said that as he crossed the continent, he felt proud to have been “… involved in the production of more than 1,000 MW of hydro-electric power… the creation of data centres and solar installations in more than 1,600 localities, benefiting between nine and 10m people”. Bathily incidentally supports the two-year-old Ghana-headquartered AfroChampions Initiative, which seeks to build up homegrown multi-national companies across the continent. In itself, AfroChampions is a powerful indicator of African optimism and opportunity, despite the challenges. Accordingly, the One Planet Summit in Nairobi could usefully signal to the wider world both an urgent need to act as well as deliberative intent. 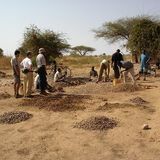 basin organizations by the Agence Française de Development and the World Bank is supporting the Niger Basin Authority. The 2018 One Planet Summit said 1.5 million euros had been committed to 30 countries in Africa, where 20 adaptation projects had already been identified. This could be the right way to invest in the future. Joyce Msuya, a Tanzanian microbiologist who serves as Acting Executive Director of UN Environment, recently pointed to an example of African “ingenuity” when faced with climate change. “On February 7,” she said, “a boat made entirely of recycled plastic — the world’s first — cruised into a quiet harbour in Zanzibar after two weeks at sea.” It was, Msuya added, a remarkable example of human ingenuity and offered the possibility Africa can affect “systemic change”. Will it have the resources for it? Strategic assistance will be essential. After 2018, it became clear that the One Planet Summit was actively engaging and recruiting public and private actors in the fight against climate change. This will be key for Africa. According to the African Development Bank (AfDB), the continent will need $20 to 30 billion every year for the next two decades to help fund climate change adaptation and resilience and accelerate the transition towards a low-carbon economy. When the Paris pact was being signed four years ago, AfDB president Akinwumi Adesina declared “Africa has been short-changed by climate change. Africa must not be short-changed by climate finance.” The Nairobi Summit, which will bring together key world figures, CEOs and civil society leaders, must respond to the call to action. The Brazilian industry of machinery and equipment prepares the Agrishow 2019 equipment, with foreign buyers (importers, distributors and representatives), coming to Brazil especially for this purpose. This is a commercial promotion action organized by the Brazil Machinery Solutions Program, a result of the partnership between the Brazilian Agency of Promotion of Export and Investments (ApexBrasil) and the Brazilian Machinery Builders´ Association (ABIMAQ). Named the Buyer Project, this International Round of Business has the main purpose of potentializing the contact and negotiations between Brazilian manufacturers and importers from the most diverse countries. During two to three days, the BMS Program organizes dozens of meetings between the stakeholders, in which the companies from the sector present their products to foreign visitors. he 26th International Fair of Agricultural Technology in Action – Agrishow 2019, Brazil’s largest agricultural technology fair and one of the three largest in the world, will be held from April 29th to May 03rd, in Ribeirão Preto – São Paulo. It is an event recognized as a scenario for launching the main trends and innovations for the agribusiness, in which solutions are presented for all kinds of cultures and properties. In 25 years, it has become a reference for the sector in the whole world. In its last edition, in 2018, it brought together more than 800 exhibitor brands, received 160 thousand qualified visitors from more than 80 countries and summed R$ 2.7 billion in business initiated during the event. Promotion of Export and Investments (ApexBrasil) acts to promote the Brazilian products and services abroad and to attract foreign investments for strategic sectors of the Brazilian economy. The Agency carries out diversified actions of commercial promotion, such as prospective and trade missions, business rounds, support to the participation of Brazilian companies in large international fairs, and visits of foreign buyers and opinion makers to get to know the Brazilian productive framework. More information: www.apexbrasil.com.br . About ABIMAQ – The Brazilian Machinery Builders´ Association (ABIMAQ) was founded in 1937, with the purpose of acting on behalf of strengthening the national industry, mobilizing the sector, carrying out actions next to the political and economic instances, stimulating international trade and cooperation and contributing to improve their performance in terms of technology, capacitation of human resources and managerial upgrading. More information: www.abimaq.org.br . relative to last year. The sunflower production forecast came in unchanged at 563,590 tons and is still down 35% y/y, which poses upside risk to the price outlook. Soybeans have seen a decrease in both planted area and the production estimate, coming in down 7% and 17% respectively relative to the previous season. The soybean production estimate came in at 1.28 million tons which is still a third record crop, for the crop. The domestic oilseeds situation therefore indicates a tightening supply outlook which will boost prices in the medium term. In the case of winter crops, the better wheat season particularly in the Western Cape (WC) has ensured a good crop of 1.84 million tons which will help reduce the import demand by almost 36% y/y to just over 1 million tons. Weather will be critical for the WC as we head into the new planting season for winter crops. For the summer grains, the season is off to a good end with good rains boosting crop prospects. The only concern is the possible crop damage if frost comes in earlier than expected in areas where the maize plantings were very late. The short to medium term weather outlook still calls for rains across the producing areas which bodes well for the developing crops and a good finish to the 2018/19 summer crop season. On the consumer front, adequate supplies of grain for the year ahead will help limit further food price acceleration in the medium term. This is good for interest rates which are expected to remain flat. The agriculture GDP is expected to still disappoint in the near term but will rebound marginally in the second half of 2019 and thereafter accelerate into 2020. GEM showcases ideal SANY equipment for agriculture at NAMPO 2019 Goscor Earth Moving (GEM), the official distributor of SANY, the fifthlargest construction and related equipment manufacturer in the world, will showcase its front-end loader and excavator range at Grain SA’s NAMPO Harvest Day from 14 to 17 May in Bothaville in the Free State. ith the agricultural sector representing a potential growth area for the brand in Africa, NAMPO 2019 is the ideal opportunity to have the farming community get up close and personal with the SANY range, according to Murray Leith, who heads up SANY Operations at GEM. The positive flow hydraulic system has also reduced fuel consumption by 10%, due to advanced dynamic control technology providing a real-time match between engine power and main pump power. Fuel economy is optimised further by means of four power modes for added flexibility. Part of the Goscor Group, GEM offers SANY excavators, front-end loaders, motor graders and rollers for the construction, mining, agriculture, sand and stone, forestry, roadworks, and planthire sectors. With its primary focus on the mining industry in Africa at the moment, agriculture is nevertheless an important market that GEM is focusing its attention on. The SYL 956H1 front-end loader will take centre stage at the Goscor Group stand at NAMPO 2019. This machine is built tough, with a bucket capacity from 3 m3 to 4.6 m3 to ensure it is wellsuited for the agricultural sector. The highly-efficient drive system features a rotary automatic gearbox that boosts travel speed by 10%, and increases towing force by over 6%. The rated load is 5 000 kg, rated power is 164 kW, and the break-out force is 175 kN. The SY215C medium excavator has an operating weight of 21 900 kg, an engine output of 114 kW, and a 1 m3 bucket capacity. Features include a customised engine, strengthened components, high operating efficiency, low fuel consumption, easy maintenance, and an ergonomic cabin to promote operator comfort and productivity. At NAMPO 2018, it showcased a range of SANY compact equipment that is ideal for agricultural applications, with great success. The penetration into such diverse markets also represents GEM’s ongoing investment in the SANY brand, which is quickly gaining a major footprint in Africa. “The advantage of SANY for our agricultural customers is not only highly competitive pricing in the industry, but also the best return on your investment with technology that has been adapted especially for arduous African operating conditions. In addition, our association with the Goscor Group means that not only do we have an extensive branch network, but can offer superlative customer service and technical backup,” Leith concludes. The operating efficiency of the SY215C has been boosted by 8% thanks to an innovative controller that reduces the response time of the hydraulic components, as well as lowering the internal power loss of the system, and boosting the output power. Visit Goscor Earth Moving (GEM), part of the Goscor Group, and official SANY distributor, at Stand C17 at NAMPO 2019. For more information go to www.grainsa.co.za/pages/ nampo/nampo-home. AGRICULTURE need deeper wells to continue tapping local groundwater sources. Smart Irrigation: Less Is More Merely spraying water onto plants used to qualify as good irrigation, but research in recent years found that there are immense gains in efficiency – unbelievably obvious ones – to be made with the integration of some rather basic technology. The problem has not been a mistake on the part of farmers, rather their irrigation systems have been stuck in the 1950s. Smarter systems are being developed at every scale, from nursery farms up to large fields. he United Nations estimates that farmers will need to grow 70% more food to feed the population by 2050 while available fresh water resources will continue to shrink. that don’t need to be watered. For instance, the system can be set to shut off flow to the nozzles as they pass over farm roads, ponds, or patches of fallow ground. Faced with multiple challenges related to water availability including drought and decreasing groundwater, here are growing trends in farm irrigation. Measuring Water Flow Precise measurement of water usage with water flowmeters can prevent overwatering and reduce costs for farmers. As water resources become more limited and expensive it will be more important to have accurate data on how much water is being used to irrigate. Additionally, soil sensors can track soil moisture to determine how much water should be used and allow farmers to make water-saving adjustments. Drought-Resistant Seeds Biotech companies are using advanced genomics to create seeds for crops that need less water and are more tolerant of drought conditions. For example, drought resistant crops may have deeper roots or stomata that close sooner to hold more moisture. Drip Irrigation Drip irrigation allows for precise control of the application of water and fertilizer, which can greatly reduce the amount of water needed for crop irrigation. Although it can cost up to $ 1 million to install, many farmers are seeing the appeal of saving water, which can be used to plant more crops or reduce costs. Data Analytics New software products that crunch large amounts of data can provide farmers with important information that they previously didn’t have access to. Using data such as local weather as well as data collected from their equipment, farmers can receive recommendations and better understand how much water is needed to optimize production while minimizing water waste. Every gallon that doesn’t get pumped onto a field equates to savings (electrical costs) in a farmer’s pocket, and it means more water is staying in local waterways and aquifers. Most important, proper irrigation means better crop yields, because overwatering can be just as harmful to crops as underwatering. The next big gains in water management will come from weather prediction. Free systems like the SmartIrrigation Apps help farmers develop irrigation plans for various crops; for instance, SmartIrrigation offers four different apps for citrus, strawberry, and cotton crops as well as for “Urban Lawn.” The goal is to help farmers avoid running their irrigation systems if rain is in their future – or worse, running their systems while the rain is actually falling. More and more, watering will become a matter of using a tablet computer than actually turning valves. As farms continue to develop, economics will favor producers who can produce more with less water, the right plants, less fertilizer, and lower energy costs. It pays to work green. Uralkali battles low nutrient efficiency with DripKALI. are scarce or limited, but is applicable in general for the purpose to have more flexibility in scheduling planting and other crop management activities, control additional applications of nutrients and agro chemicals, increase crop production. Nutrients applied to a crop with water are distributed more evenly compared to dry fertilizer. Furthermore dry application makes growers reliant on weather conditions or simply on the amount of rain, which should be right enough to dissolve fertilizer, but leave it in a top 20-40 cm soil layer for assimilation by roots. MOP is commonly used in fertigation for a variety of crops, it is highly soluble in water and is the most concentrated source of potassium among potash fertilizers. It contains 62% K2O compared to 50% K2O in potassium sulphate and 46% K2O in potassium nitrate. Besides, MOP is compatible with all types of water-soluble fertilizers and can be safely used in fertigation systems. DripKALI is completely water soluble and is marketed in branded 25 kg bags, which makes it recognizable and easy to handle. Uralkali is the leading global manufacturer of muriate of potash (MOP), mineral fertilizer that contains potassium â&#x20AC;&#x201C; one of the vital chemical elements for all living organisms. The company produces annually about 20% of total world MOP production. Uralkali controls the full supply chain, beginning with ore mining and finishing with shipping the final product to a customer. Export sales are done through Uralkali Trading SIA with its branch offices strategically located all around the globe. For more information about Uralkali and products please visit www.uralkali-trading.com. Carlo Beukes, BMG’s business unit manager, Power Transmission. “BMG’s specialist services to the sugar sector include bearing and gearbox inspection, bearing and chain refurbishment, large size bearing assembly, alignment and balancing, as well as customised product design. BMG also offers a troubleshooting and maintenance service, condition monitoring and training. machinery. No lubrication is required during assembly or disassembly. These torsional flexible couplings have a maximum torque of 1 288 800 Nm and shaft diameters up to 600 mm. This range is equipped with specially designed elastic elements, which work in compression, allowing for maximum torque transfer, heat dissipation and product longevity. These polyurethane elements are resistant to water, oil and dust. Vulkan Flexomax GBN couplings are available in 16 sizes with nine designs and have customisable options to meet the requirements of restricted applications. BMG supplies a wide range of products, selected especially for the sugar industry throughout Africa. These components include carrier and diffuser chain, knife and shredder bearing housings, custom sprockets and gear couplings, as well as steam gaskets, heat exchangers and hydraulic tools. Diffuser and mill gearboxes, in addition to mill lubrication and hydraulic systems, form a critical part of this range. innovative technological developments designed to help enhance the sustainability, productivity and profitability of farm businesses. They range from a bronze medal in the SIMA Innovation Awards for Case IH XPower digital weed control technology to the 2019 Tractor of the Year title for the Maxxum 145 ActiveDrive 8.
package, drives through a standard CVXDrive continuously-variable transmission. Where large amounts of road travel or field tasks such as mowing, baling, light tillage and specialist operations where it may be beneficial to separate engine speed and forward speed are concerned, this has significant advantages. 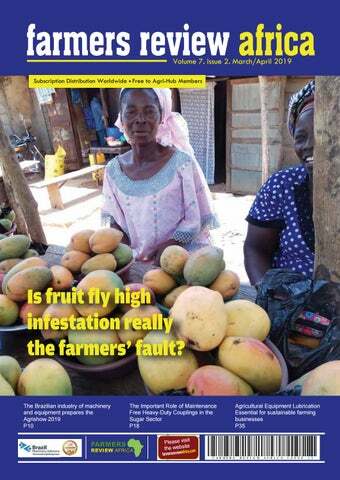 Is fruit fly high infestation really the farmers’ fault? uring my 30 years in the field of fruit flies and pest management, I had endless conversations with farmers, experts, regulators, officials, scientists from the agrichemical industry, etc. We talked about endless subjects related to pest control. the beginning of a new era and relationships between farmers and researchers, experts, government officials, and agri-chemical personnel. The mutual goal of quality results can create an open discussion based on needs and results or requirements. However, it took me a while to notice the following behavior: whenever fruit fly control is going well, we tend to contribute it to the fact that ‘the solution’ is good. Yet, when results are not good, we tend to focus mainly on the farmer and the things he did wrong, or not as he should have. farmer/a counselor/an expert, etc. (in short, FCE). FCE: Hi Dr. Nimrod, how are you? Nimrod: Thanks, good, how can I help? FCE: Everything is fine, but fruit fly infestation is higher than I would like it to be, and there is a lot of labor and high cost involved in the fruit fly control, which influences the business results of the farm. should design any solution to be easy-to-use for everybody else (meaning, for us the ordinary people). Basically users, in all fields, want the same thing - a quality product, simple and easy to operate which will deliver and do the task or work we expect. That’s why we all use smartphones that are smart and sophisticated but at the same time also easy-to-use (much more than in the past). Even a PC popular operating systems failed in the smartphone world. Why? Because it was less convenient to operate than its alternatives. Now let’s get back to agriculture and fruit fly management. Here, too, we have a User and a Provider. elements, also the following: •	Results – the extent of damage by fruit flies (and more generally, by pests) – infestation below the economic threshold. •	Low Labor demands. •	Safety of usage – for humans and the environment. •	Convenience and simplicity of operation (low complexity). One thing is certain - when we encounter a repeated problem with pest management – we at Biofeed do not blame the farmer. It’s that simple and so understandable. If you are a farmer, just remember that you have all the right to demand from The Providers - a better fruit fly control solutions. The farmer role is to produce food (fruits, vegetables, etc.) and live from the revenue it will bring. For that end, he needs to use pest control solutions, such as for fruit fly control. The farmer expects the same as every user - a product that provides a solution to his problems; cost-effective, safe and simple to operate. One thing is certain - when we encounter a repeated problem with pest management - do not blame the farmer. herry cultivation is one of the most complex and delicate crops. Like other fruits such as kiwi, peach or plum, it can suffer important negative effects from excessive rainfall, increasingly common in the season of fruit ripening (starting from the second decade of May). Leading international player in the technical textile sector for agriculture, Arrigoni proposes new solutions that improve cultivation practices. Moreover, it combines the possibility of protecting crops from the attack of harmful insects, such as the dreaded Drosophila Suzukii and other species to the advantages of defense against atmospheric agents. “Until now – explains Giuseppe Netti, agronomist from Arrigoni – damages of rain on cherries was prevented by means of plastic film covers. In several cases this solution produces satisfactory results. However, it is not 100% effective. This is due to the fact that a totally “waterproof” product reduces the air passage (which remains only in the horizontal direction) and favors a moist environment on sunny days, altering the microclimate of the orchard and causing an excess of humidity. Consequences are damage or reduction of the harvest. Moreover, such a cover can cause serious damage to the structure in the event of strong winds”. ohn Deere has welcomed the R3.7billion allocation announced in the 2019 Budget Speech to assist emerging black farmers in acquiring land and title deeds, which it believes will complement the proposed blended finance model and assist in building a more inclusive agricultural sector for the benefit of all South Africans. John Deere has also pioneered a contractor model in Kenya and neighbouring Uganda, which assists small farmers with acquiring tractors to not only plough their own lands but those of smaller farmers in their vicinity who may not have the financial resources to acquire expensive mechanization equipment. Land reform was a key focus for Finance Minister Tito Mboweni’s maiden budget speech which saw him allocate R1.8 billion for the implementation of 262 priority land-reform projects over the next three years in addition to the R3.7 billion set aside to assist emerging farmers seeking to acquire land to farm. Mboweni also announced that the Land Bank will support smallholders, and leverage partnerships with other financial institutions by disbursing R3 billion in the next fiscal year. As a member of AgBiz, the body who represents agribusinesses, John Deere is also actively involved in discussions with Government and other key stakeholders in promoting both support of small-scale emerging farmers as well as the continued growth of commercial farming operations which play an enormous role in job creation and food security in the country. “We acknowledge that the unfavorable macroeconomic conditions largely due to weak economic growth and rising demand for government expenditure left very little room for the Finance Minister to increase budget allocations but we believe he has done very well in the circumstances,” said Jacques Taylor, Managing Director for Sub-Saharan Africa at John Deere. “Transparency in how the funds will be allocated as well as collaboration with the private sector could go a long way towards ensuring the sustainability of the projects.” John Deere operates across Africa and is heavily involved in providing mechanization solutions to both large and small-scale famers across the continent. In South Africa specifically, John Deere through John Deere Financial, has for the past four years been involved with Grain SA’s New Age Farmer project where it sponsors a John Deere tractor to the winner of the New Age Farmer of the year. “Economic growth is at the center of discussions today,” said Taylor. “As John Deere, we believe transformation of the agricultural sector has to be off the back of growth in the industry.” Another notable feature of the 2019 budget speech was the increase in the fuel levy, which amounted to total of 29 cents per litre for petrol and 30 cents per litre for diesel (including the carbon tax of 9c a litre on petrol and 10c on diesel). The good news for the agriculture sector was that the diesel refund increased from R3.22 per litre to R3.33 per litre on 80% of eligible use. “Agriculture is, to a large degree, a price taker both on the input side as well as the output side so any increase in cost has a direct impact on the producers’ profitability and cost structure,” said Taylor. “The increase of 11c in the diesel rebate for agriculture is welcomed and will offer some relief.” The proposed Carbon Tax Bill is expected to come into effect in June 2019, subject to sign-off by the President. Based on The Carbon Tax Bill tabled by Treasury in November 2018, indications are that Agriculture, Forestry and Land Use will be exempt from the first phase of implementation. carvone, found in donkey dung and sheep dung, respectively. Stable flies are a serious challenge for livestock and people across the world in general, and in Africa specifically. These blood-sucking insects transmit various pathogens, for example trypanosomes that cause the deadly trypanosomiasis,” noted icipe scientist Dr Merid Getahun, who led the study. “These results have great potential. For example, these chemicals could be used in baiting traps to attract pregnant stable flies, hence reducing populations one generation to another,” Baleba further observed. Dr Dan Masiga, Head, icipe Animal Health Theme added: “Any tools that improve control of vectors of animal diseases enhance the potential of African farmers to be productive. Therefore, this research is especially exciting because we can work in partnership with industry to translate into technologies and disseminate them to communities”. Such a goal will be supported by icipe’s longstanding success in utilising chemical odours in insects to modify their behaviour, as a way of controlling them. ight is crucial for most life-forms. Plants relay on light for photosynthesis. Utilizing artificial light to support this process enables farmers to control the development, shape, and flowering period of plants. The quantity of light, its spectral composition and light duration have an effect on plant properties in the growth process. Therefore, lighting is a crucial variable in today’s horticultural industry. While High-Pressure Sodium (HPS) based lighting is still widely spread, farmers and greenhouse owners increasingly experience the benefits LED based lighting solutions offer in comparison. These include a more targeted influence through specific color spectrums and wavelengths, lower power consumption and longer lifespan, resulting in lower maintenance and operational costs. high power consumption and the heat of HPS luminaires also demand a significant distance between light source and plants, leaving them primarily suitable for top-lighting. LED based solutions in comparison produce almost no heat and can therefore also be used for multi-layer or ‘vertical’ cultivation. growth, among other things. The right mix and the temporary addition of certain wavelengths – adapted specifically to the individual needs of the plant – can then trigger the desired effect in line with the grower’s goals. Since the discovery that the spectrum of light offered to plants can change plant properties (for example, blossom and fruit growth rates), there has been an enormous increase in the interest by the horticultural industry in LEDs. LEDs are particularly well suited to this application field. Leading experts for horticulture LED technology, such as OSRAM Opto Semiconductors, over the last decade have broadened their portfolio and provide options for all types of plants, enabling the grower to adapt the light exactly to the needs of various crops. Full agri range from Pratley Adhesives, Pratley Minerals at NAMPO 2019 The full range of products from Pratley Adhesives and Pratley Minerals for the agricultural industry will be on display at Grain SA’s NAMPO Harvest Day 2019, the leading event of its kind for the farming community. ratley has been exhibiting at NAMPO for about 20 years, and sees the event as a major platform to engage with cooperatives, wholesalers, and the general public. “We see agriculture and farming as a significant growth market for Pratley,” comments Pratley National Sales & Marketing Manager Mark Bell. Products on display from the Pratley Minerals division include Pratley Clinomix® livestock feed additive. Benefits of Clinomix® include increased non-protein nitrogen (NPN) for ruminants, and a major a reduction in odour and faecal moisture. Pratley Clinomix® is also a highly-effective mycotoxin binder that improves the flowability and anti-caking of feed. Another major feature is that it effectively alleviates acute and chronic diarrhoea and/or scouring in high-density feedlots and farms. Pratley Clinoxin® is a broad-spectrum mycotoxin binder, particularly in the poultry industry. It controls mould proliferation, and selectively binds mycotoxins, especially aflatoxins, in contaminated animal feed. It also has the major benefit of reducing ammonia levels and faecal moisture in poultry houses. Both Clinoxin® and Clinomix® are registered remedies with the South African Department of Agriculture. Pratley National Sales and Marketing Manager Mark Bell Products on display from the Pratley Adhesives range include those used for general repair, farm maintenance, and specific repairs of agricultural and mechanical equipment. Along with their traditional high-performance epoxy and acrylic products, Pratley will also showcase their new Superglue range, and brand-new RTV Silicone Gasket Maker. I have been using Calkonutrium® for the past two years, and I got a higher yield every time. My corn could handle the drought better than usual because they had a bigger root system. Get a better re-growth (Rye, Oats, barley ...) ? I got very good results on my re-growth of my feeds. I had my livestock feeds analysied by an independent livestock feed company , and the results were very impressive. The past three years we had a drought, and often I could not believe how good my crops where looking under these circumstances. And the only reason I could find was, Calkonutrium®. Rudi Van Den Berg, Bothaville, Free State. n 2014 Dfert Fertilizer (South Africa) took hands with FCA Fertilisants (France). FCA Fertilisants has made it possible for Dfert Fertilizer to import a Biological product in a granule form called Calkonutrium®. This product can become part of every farmers Fertilizer application program. Four years of trials on different crops has shown us a very positive effect. This has also shown us that Biological Fertilizer is the answer for sustainable fertility for the future. In the past season (2018) we interviewed a few farmers regarding their use of Calkonutrium® in there Fertilization Program. This is the farmers view of the product : In your opinion, is there a future for Biological fertilizer like Calkonutrium® ? Yes, for sure. I am a sheep farmer, so it is very important to me to have good quality feed, as well as to keep the soil healthy. Calkonutrium® takes care of both. Definitely, I will never plant without Calkonutrium® again. If I had to choose between conventional fertilizer and Calkonutrium®, I would choose Calkonutrium®. For farmers that are unfamiliar with this product, I would encourage you to use this product to increase your crop yield. Calkonutrium® is undoubtedly one of the easiest products to use to increase your yield. Did you notice any physiologicaldifference in plants that was Fertilized with Calkonutrium® and those that was not ? I noticed a clear difference in my feed. Yes, My crops had a bigger root system and they looked much healthier than usual. Johan Potgieter ,Ventersburg, Free State . What effects did you notice about the fertilization of Calkonutrium® during a drought ? I could see that my plants, especially my corn had a better resistance during a drought and it also recovered faster than usual after it had rained. FCA Fertilisants and Dfert will also be a part of the Nampo Exhibition 2019. Our booth will be by the French Pavillion. Please come and visit us for further information and any questions about this unique product. its versatility and flexibility. Features include exceptional performance, dig depth, and dump height. Tier 4-compliant, the E55 is available with a clamp-ready extendable-arm configuration for additional length when fully extended. This allows for extended reach without having to upsize the machine, representing a significant cost-saving for farmers. An angle-blade option is also available. Bobcat also has a range of auger attachments to dig holes quickly and accurately. Heavy-duty hydraulics make these attachments ideal for any soil conditions. Farmers can choose between a direct-drive auger for an optimum balance between torque and RPM, or a gear-driven planetary auger for applications that require the most torque. Multiple bit types and teeth enhance the flexibility of these attachments even further. The range of agricultural attachments available from Bobcat extends to buckets, fertilisers, and grain loaders for large-scale agricultural jobs, and grapples and graders for tough forestry work, diggers and drop hammers for construction, concrete mixers for laying down groundwork, or angle brooms for clean-up. Visit Bobcat Equipment South Africa, part of the Goscor Group, at Stand C17 at NAMPO 2019. For more information go to www.grainsa.co.za/ pages/nampo/nampo-home. refrigeration. Utilizing these advancements can help a dairy’s bottom line. Paul Mueller Company designs and manufactures processing equipment for use in dairy farms; and various applications in food, beverage, and pharmaceutical industries. Paul Mueller is a global company with representation in all continents. In Kenya, Mueller have partnered with EuroDairy Equipment Limited as their sole distributor to import and install Mueller milk cooling equipment. The Kenyan dairy sector is rapidly growing and is dominated by smallholder dairy farmers. Total raw milk production in Kenya is currently estimated at 5 billion liters per year. This figure may be higher because not all the production within the informal sector may be account for. Only about 600million liters are collected and processed formally. Reports from processors indicate a challenge with the quality of milk supplied to the processors. This is as a result of weak milking practices, fragmented small- scale dairy farming system and weak infrastructure in terms of roads and electricity connectivity, posing lack of milk cooling and storage facilities on the farms, hence milk spoilage and loss. This in turn causes huge losses to the farmers and compromises efforts by farmers to embrace technology that increases productivity. Mueller offers technical training and ensures availability of spares to EuroDairy, who work hand in hand with its principal partner Kanters Holland Bv. https://www.kantersbv.com This ensures that customers enjoy premier after sales round the clock technical support, preventive maintenance services and spare parts with minimum downtime. In sum, Kanters Holland BV in collaboration with EuroDairy provides milk harvesting solutions (Milking Machines) and Mueller in partnership with EuroDairy steps in to cure the post-harvesting challenges. the workforce, gain valuable skills and earn a basic wage. Furthermore, these YES youth are equipped with smartphone devices to learn valuable skills including work readiness, health and safety, financial wellness and more through the YES application. YES also enjoys a strategic partnership with LinkedIn. This means that YES youth can access one of the largest professional networks in the world, and build CVs and references that put them in front of potential future employers. A further benefit of YES is that it offers attractive benefits to businesses looking to improve their Broad-Based Black Economic Empowerment (B-BBEE) scorecard rating. Qualifying businesses can improve their B-BBEE rating by either 1 or 2 levels by employing and absorbing YES youth, in line with the Practice Note issued in October 2018. “Agriculture is an important sector for the South African economy,” says YES chief executive Tashmia Ismail-Saville, who points out that there is an over-concentration of youth looking for work opportunities in Gauteng, but finding themselves competing with highly-skilled people for entry-level jobs. argill and Heifer International have joined forces to create The Hatching Hope Global Initiative. The bold initiative aims to improve the nutrition and economic livelihoods of 100 million people by 2030 through the production, promotion and consumption of poultry. Hatching Hope will work directly with women smallholder farmers, initially in India, Mexico and Kenya. The program helps farmers not only feed their families but also become part of the solution to bridging the global food and nutrition security gap, while boosting local economies and providing nutrition education. “We believe that the key to ending hunger and poverty is for farmers to be able to earn a living income,” said Pierre Ferrari, president and CEO of Heifer International. “Through Hatching Hope, we’re investing in smart, resourceful women farmers, working with them to improve their products and access new markets. We’re excited to launch Hatching Hope as it can be quickly scaled up, supporting more farmers around the world.” Hatching Hope will drive awareness of the nutritional benefits of poultry and eggs and stoke demand through local and national education campaigns. Farmers will be connected to markets and equipped with the goods and services they need to be successful participants in the poultry value chain. knowledge in the poultry industry and global market. Both have a strong global footprint and on-the-ground presence in developing countries and the ability to mobilize staff to address specific issues facing the poultry value chain in the countries where Hatching Hope will operate. “We think poultry offers a unique set of advantages that set farmers up for success,” said Warta. “Meat and eggs present an opportunity to involve all members of the household –from women to children to the elderly. The poultry growing cycle is also fastpaced, so it can deliver meat and eggs quickly and provide a valuable nutritional source – particularly for children. armers need machines that work as long and hard as they do. In order to create a sustainable business in the agricultural sector, good equipment maintenance is critical. Farming equipment has to work for long hours, and usually in tough conditions. Machinery components such as engines, axles and transmissions need the correct lubrication reliability solution to increase their longevity and sustain the productivity required to keep a farming or agriculture business profitable. 000km without an oil change, while Monolec® Ultra 8800 only needs changing every 100 000km. Although it can be tempting to reduce operating costs by using cheaper products, the long-term risks are high. While inferior lubricants won’t cause immediate equipment breakdowns, they can lead to significant maintenance expenses over time. “The right lubricant helps protect equipment in all conditions, even when operating at maximum volumes. By guarding against wear, deposits and corrosion, machinery keeps functioning efficiently and the risk of costly unplanned downtime is reduced,” says Callum Ford, National Marketing Manager at LE. For axles and transmissions, a quality product will keep equipment running well by lubricating the transmission, wet brakes and hydraulic systems of agricultural machinery like tractors, diggers and combine harvesters. The correct lubricant will help to smooth brakes, improve the longevity of oil and protect against wear. For more extreme conditions, Almagard® Vari-Purpose Lubricant 3752 is specified. It is extremely tacky and will not wash off, pound out or melt and run, even in severe conditions. It is ideal for on-and off-road agricultural equipment where high impact occurs. LE’s Almatek® General Purpose Lubricant 1233 is designed to withstand shock loading, poundout and water washout in friction and anti-friction bearings, chassis points and other greaselubricated applications. This versatile, tacky grease is specially formulated to give superior protection and long service life. “Agricultural producers need to partner with a lubrication supplier that can help them find the best solution for their equipment and help develop a maintenance schedule that fits in with their off season. LE’s consultants can help clients manage their lubrication for maximised effectiveness. A lubrication consultant will offer education and advice on the right way to store and handle lubrication, where to properly apply lubrication on any equipment, when to re-grease a surface, how to check lubrication is working properly and is the right type for a particular type of machinery, and how much lubrication to use for each application,” Ford concludes. Do you know YOUR Grain Temperature? Portable, Computerized & Wireless Grain Monitoring Systems See your local silo dealer for more details.